The Klencke Atlas is one of the world's biggest: it measures 176 x 231 cm when open. It takes its name from Joannes Klencke, who presented it to Charles II on his restoration to the British thrones in 1660. Its size and its 40 or so large wall maps from the Golden Age of Dutch mapmaking were supposed to suggest that it contained all the knowledge in the world. At another level, it was a bribe intended to spur the King into granting Klencke and his associates trading privileges and titles. Charles, who was a map enthusiast, appreciated the gift. 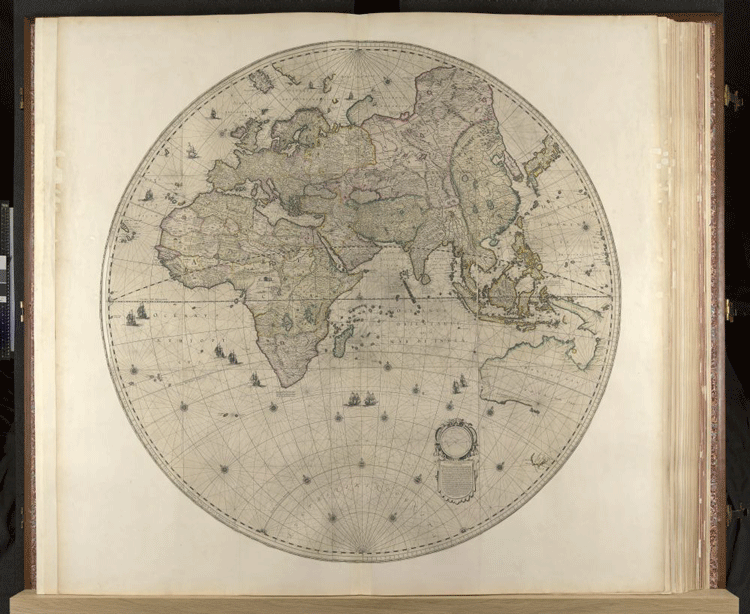 He placed the atlas with his most precious possessions in his cabinet of curiosities, and Klencke was knighted. Later generations have benefited too. The binding has protected the wall maps which have survived for us to enjoy - unlike the vast majority of other wall maps which, exposed to light, heat and dirt when hung on walls, have crumbled away.